It now appears the Tasman has claimed the life of Andrew McAuley. The New Zealand search and rescue authorities have given up the search after 3 days of fruitless effort. His kayak has been recovered but there is no trace of Andrew and he has been too long in the cold water to survive. 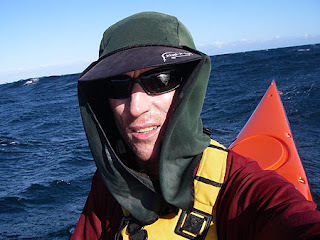 Despite his years of experience and careful planning, the merciless waters of the Tasman Sea beat Andrew in his attempt to be the first person to paddle from Australia to New Zealand. Ascended unexplored and unclimbed mountains including a Mt Jo Pakistan and Grupo la Paz, Patagonia. Kayaked Bass Strait three times including the first non stop crossing. First to kayak the Gulf of Carpenteria , a feat which earned him Australian Geographic Adventurer of the year award in 2005. First to take a kayak to Antarctica and attempted to paddle around the Antarctic Peninsula. Worked with of the Kitesled team to develop a revolutionary polar exploration vehicle . He was one of those rare individuals who had the explorers gene. The sort of person who understood the wisdom of pushing both the geographic and personal frontiers and had the determination and ability to actually do so. My sincere condolences go out to his family and friends. On a related note , the Crossing the Ditch team still intend to cross the Tasman Sea. They have delayed departure until next summer as they are still making adjustments to their boat and their weather deadline was 7/Feb/2007. This should give them plenty of time to test and prepare their kayak. Update: Australia to New Zealand by Kayak.